Across the Red River Valley – from Harwood to Hawley and various points in between – dozens of artists will throw open the doors to 41 different studios and workspaces this weekend during the Fargo-Moorhead Visual Artists’ Studio Crawl. The annual event runs Saturday, October 5 and Sunday, October 6 and it’s a great way for artists to connect with their fans and for art enthusiasts to pull back the veil and better understand the artists’ creative processes. Offutt’s garage studio is a very creative space, and a fan favorite. It offers a shimmering garden of glass gourds and vessels for sale, kegs of root beer for refreshment and strangely hypnotic glassblowing demonstrations. Participants have a chance to see painters, sculptors, woodworkers, glassmakers, photographers, printmakers, fiber artists and more at work and up close. 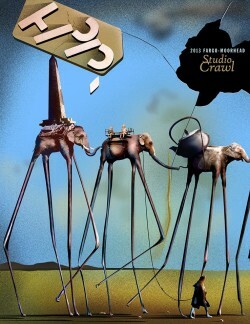 The Studio Crawl offers a unique opportunity to view and buy art in a variety of studio environments, which is a very different experience than shopping at a gallery or an art fair. In just a few hours, a participant could take in studios located in country houses, garages and shared urban spaces. Some participants opt to research and map out their routes in advance to make sure they hit all their favorite spots. Others take advantage of the walkable downtown studio scene to discover some new favorites. Some stop into a few studios for an hour or so on a leisurely afternoon, while others make a day of it. There’s no right or wrong way to approach the experience. And since the participating artists and their work are different every year, Studio Crawl participants are guaranteed to discover something new each time they attend. Moorhead graphic designer and photographer Dennis Krull works out of 5Foot20 Design Studio, which is arguably one of the most distinctive workspaces on the Crawl this year. Despite his studio’s unusual properties, it works perfectly for the Studio Crawl. “I love to meet new people and it is a great venue to show people what I do,” he said. Demonstrations, interactive exhibits and conversation over food and drinks are just some of the ways that artists and participants connect on the Studio Crawl. This year, some studios are offering collaborative portrait experiments and free caricatures as well. And the artists encourage participants to take their time and ask questions. “I love seeing and hearing their reaction when they finally know how each piece is created,” Krull said. The Studio Crawl serves as a yearly reunion for some artists and patrons, since many participants make it an annual event with friends and family. It’s a great event for older kids, families, groups of friends and those who are new to exploring the art world, since the atmosphere is informal and there’s no set itinerary. The event supports the Fargo Moorhead Visual Artists’ mission to “promote and support quality Visual Arts in the Fargo-Moorhead area by educating and encouraging visual artists and their communities.” When the public meets the artists in their own workspaces, it shows participants both the creative and the commercial side of being a working artist. A variety of other events are planned around the Studio Crawl weekend, including free admission to the Plains Art Museum in Fargo and The Rourke Art Museum in Moorhead with a Studio Crawl brochure. Participants can see examples of work from the participating artists at the Studio Crawl Special Preview at the Plains Art Museum now through Oct. 7. Detailed event listings, as well as artist bios, full color photos and a studio map are available in full color brochures at various local retail and studio locations and online at fmva.org.